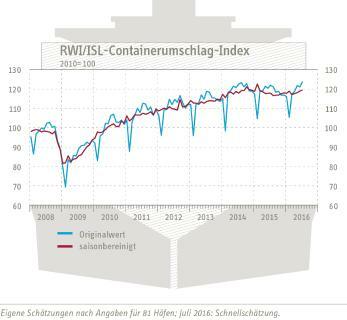 The upward movement of the Container Throughput Index of the Rheinisch-Westfälisches Institut für Wirtschaftsforschung (RWI) and the Institute of Shipping Economics and Logistics (ISL) continued in January. On a seasonally adjusted base it increased by 2.3% to 117.6 after (revised) 115.0 in December. However, the January figures can be expected to be influenced by Chinese New Year's celebrations. Experience shows that many production sites will close during the celebrations and will try to deliver in advance, which gives a push to transportation in January. This will be followed by a decline which this year will fully be registered in February since New Year was held relatively late. 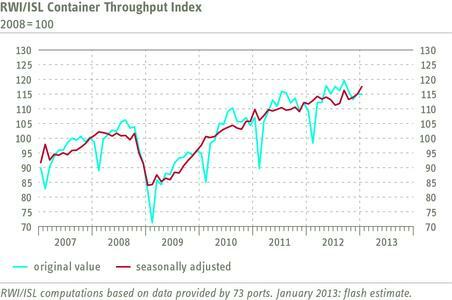 Container throughput in the destinations on Europe and America will this time be dampened even in March. The index for December was revised downward compared to the flash estimate by 0.5 points which is in the range of earlier revisions. Since the index is published, the average revision of the flash forecast was 0.8 points in the first month after its publication. The January flash forecast is based on a sample of 39 ports handling roughly 75% of the traffic represented in the index. Thanks to this relatively broad basis, it can be expected that it will only be revised slightly during the next months. 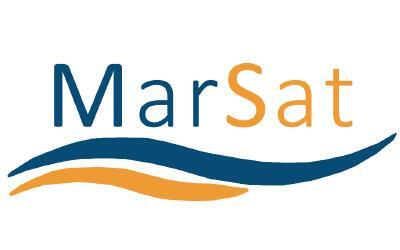 It is regularly tested which port should be included in the index. Starting with the first figure for 2013 two ports has been removed from the index which did not publish monthly data in the recent months. Three ports have been added, now the index is based on data for 73 ports handling approximately 60% of global container throughput. The Index is based on data of world container ports which are continuously monitored by the ISL as part of their market analysis. Because large parts of international merchandise trade are transported by ship, the development of port handling is a good indicator for world trade. As many ports release information about their activities only two weeks after the end of the respective month, the RWI/ISL Container Throughput Index is a reliable early indicator for the development of international merchandise trade and hence for the activity of the global economy. 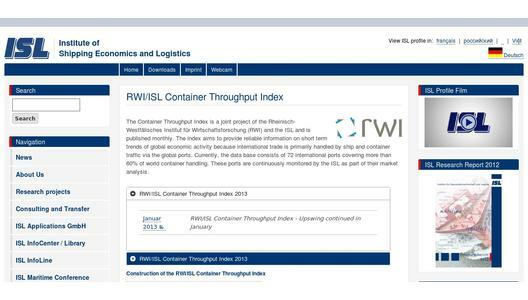 The RWI/ISL Container Throughput Index for February 2013 will be published on March 20th, 2013. The ISL - Institute of Shipping Economics and Logistics was founded in Bremen in 1954 and is one of Europe's leading institutes in the area of maritime research, consulting and knowledge transfer today. Around 60 employees in Bremen and Bremerhaven handle projects from all over the world in the fields of logistics systems, maritime economics and transport as well as information logistics and turn innovative ideas into solutions with practical applicability. 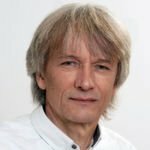 The Rheinisch-Westfälisches Institut für Wirtschaftsforschung (RWI) was founded in 1926 and sees itself as a modern center for scientific research and evidence-based policy advice. The guiding principle is to analyze the "individual prosperity and economic policy options in the demographic and social change."